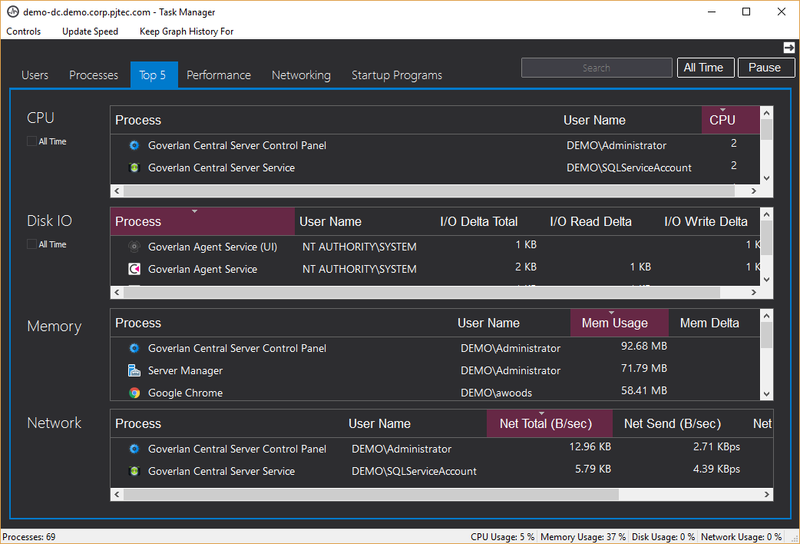 The Goverlan Task Manager is part of the Remote Control tools. 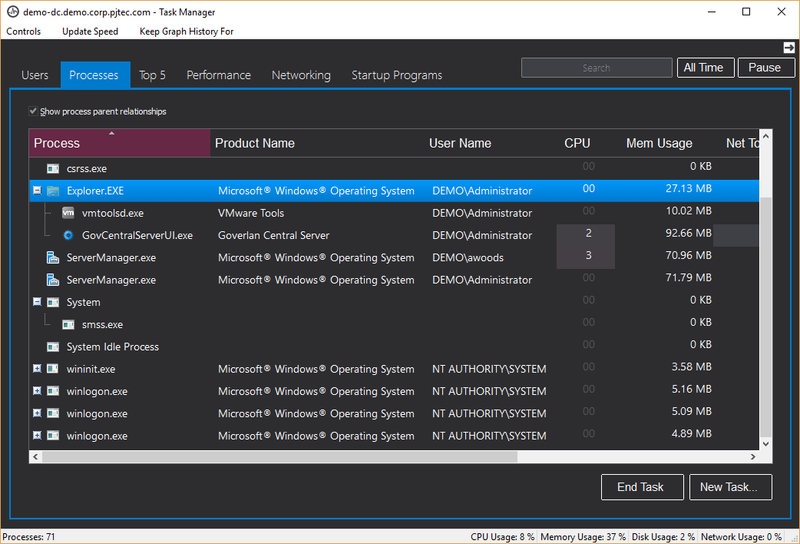 It provides additional functionality not found in the native Windows Task Manager. Right-click any computer in your Favorites list and select Task Manager. While focused on a machine. Via the Tools area, which will be focused on the admin machine. 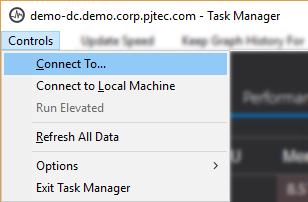 Once the Task Manager is opened, you can set the focus to another machine by selecting Controls > Connect To… or Controls > Connect to Local Machine. The Goverlan Task Manager is hosted by its process(GovTools.exe), so closing Goverlan doesn’t close any opened Task Manager session. This icon reflects the current CPU usage of the focused machine. To view more performance counters, place the mouse cursor over it and a tooltip appears which displays the CPU, Memory, Disk and Network usage counters. • Double click on this icon to trigger the Normal View Mode (see above)• Right-click on this icon to open the context-sensitive menu. The Summary View Mode only displays the primary performance counters of the focused machine. This view mode is designed for monitoring. To start the Summary View Mode, single click on the Task Manager Icon in the Windows notification area. To close the Summary View Mode, click on the Close button or single click again on the notification area icon. 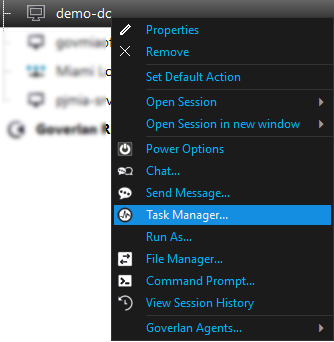 Use the Controls > Options menu to control the behavior of the Goverlan Task Manager. Always On Top Enable to keep the Task Manager window on top of all other windows. Hide When Minimized If enabled, minimizing the Task Manager removes its entry from the Windows Taskbar. Once hidden, you can restore the Task Manager by double-clicking on its icon in the Windows Notification area. Replace Windows Task Manager Enable this option if you want the Goverlan Task Manager to be your default task manager. Once enabled, starting the default task manager on your machine will open the Goverlan Task Manager (versus the Windows Task Manager). You can start the standard Windows Task Manager from the Goverlan Task Manager by selecting View > Show Windows Task Manager from the menu. 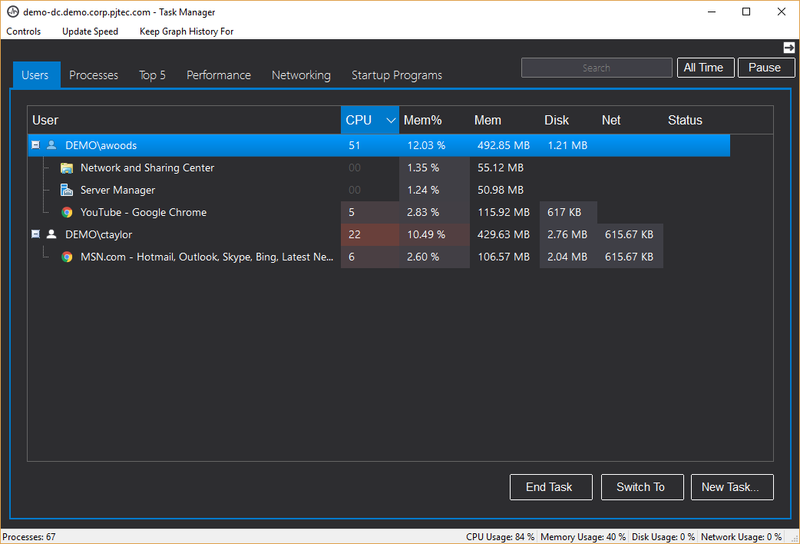 Show Windows Task Manager Select this option to display the native Windows Task Manager. This is useful if you have configured the Goverlan Task Manager to be the default task manager on your machine and you wish to use the Windows Task Manager temporarily. Refresh All Data Requests the Task Manager to re-query all data from the client machine. 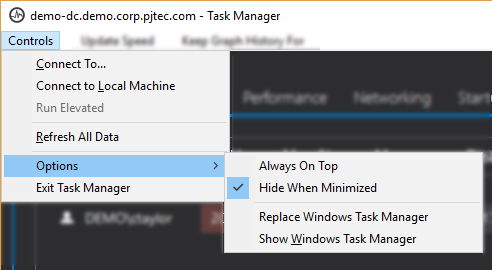 Use this option if the information displayed by the task manager seems de-synchronized or if the connection with the client machine is lost. Update Speed Use this menu to configure the update frequency of the Task Manager. To export the information displayed by the Task Manager to a text file, click on the report button located at the top-right corner of the window. On Windows Vista or later, the Goverlan Task Manager automatically detects if UAC is active and allows you to restart the process with elevated privileges. In such an environment, the Controls > Run Elevated menu entry is accessible. If you execute an action which requires elevated privileges, Goverlan automatically prompts you to switch to elevated mode. This option is disabled if UAC is not detected. The Users tab displays all apps that are running on the machine that is organized by Username. To view detailed information about any application that the user is running, expand the user’s processes, right-click the application and select Properties. You can also double-click it. To terminate an application right click it > End Process. You can also click on the End Task button after highlighting it. To modify the priority of the application, right click it, select the Set Priority submenu and click on the desired property. To start a new process, click on the New Task… button. The New Task button starts the Run As feature. 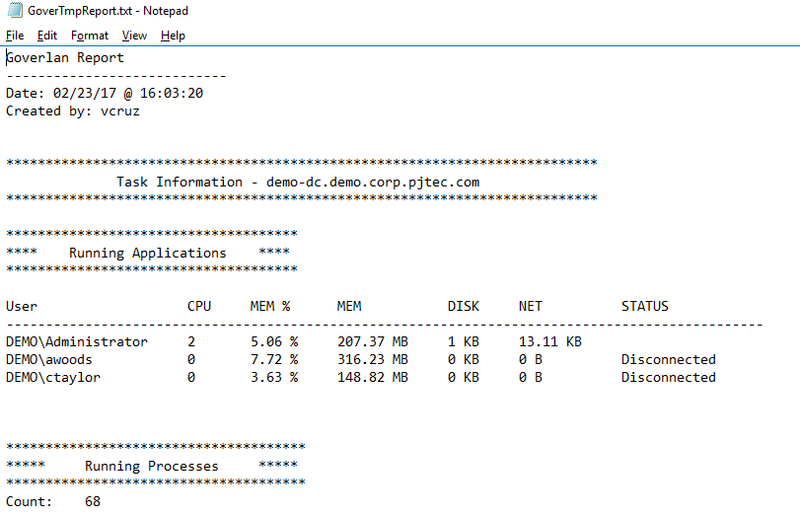 This tab displays extended information, including performance counters on all running processes on the system and their network usage, per process. Just like the Users tab, all the right-click menu options are available per process. Processes can either be displayed as a flat list or in a parent relationship tree format. You can switch between the two modes by Enabling / Disabling the Show process parent relationships option. This view format is very useful to recognize processes initiated by the console user (the processes parent is always Explorer.exe) versus processes started by the system such as services. You can also collapse entire branches to emphasize certain processes. The Processes tab can display a lot of information about each process. Most information is hidden by default to avoid cluttering the interface. 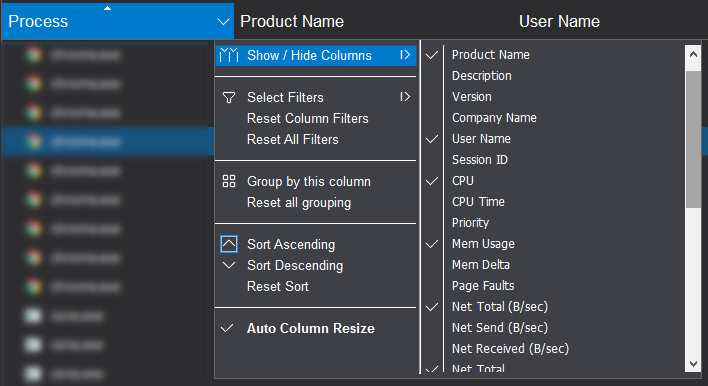 To display extended information for all processes, right-click on the columns header and Check / Uncheck the columns to be displayed. To display extended information for a process, double-click on it to view its properties. The CPU and Disk IO sections can display either instantaneous values (i.e., the processes which are currently consuming the most resources) or the All-Time Values which correspond to the processes which have used the most resources since the system started. 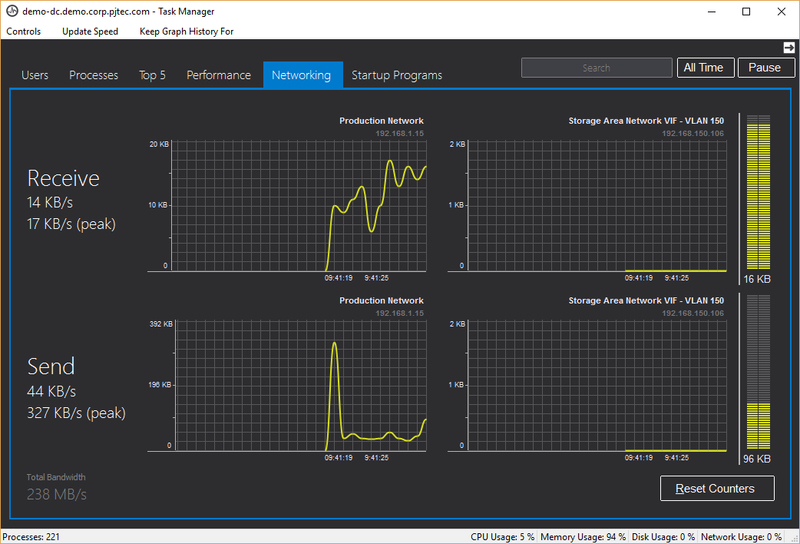 The performance tab displays real-time CPU, Memory usage, and Disk Activity information. The refresh update speed can be controlled selecting the Update Speed menu. 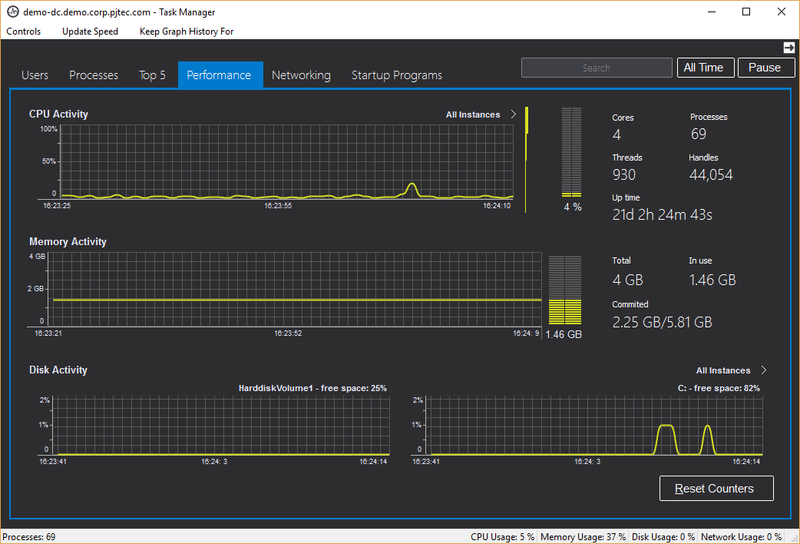 Performance counter information is also always displayed in the Task Manager bottom status bar. 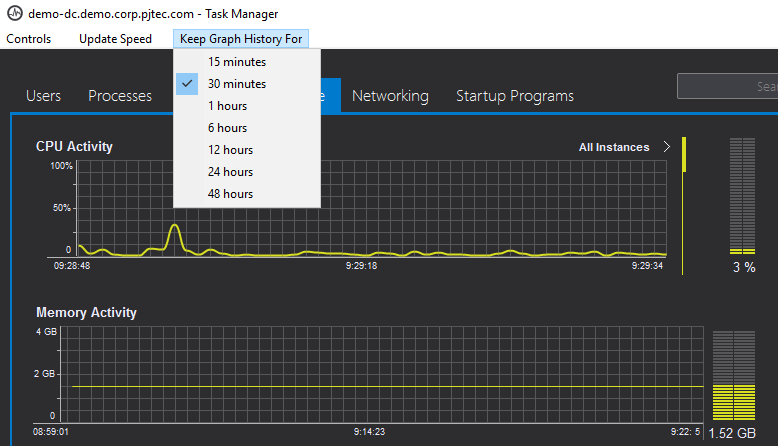 Placing the mouse over any portion the graphs timeline will show which processes were the cause of the spike, the percentage of use, its process ID, the user account that is running the process and the time at which the spike occurred. All graphs in the Performance tab have this ability. Each graph keeps historical data and the duration at which this data is kept can be set via this menu. This is useful for monitoring a process over time to determine the stability of each process on any given machine. A timeline at the bottom of the graph displays the time frame currently being displayed. You can also right-click on the graph and enable the Scale to Fit option to view the full set of recorded information. To reset the history of the performance counters, click on the Reset Counters button. 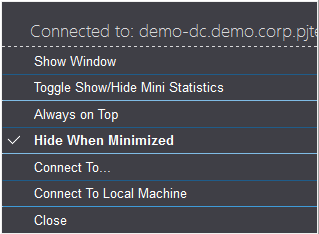 The Networking tab displays real-time network usage performance information. The information presented in this view represents the statistics for each network interface available on the computer and is divided into the Receive and Send graphs. Use this tab to view the currently configured startup program on the computer. A startup program is a process which automatically starts when a user logs in. For instance, Microsoft Messenger is often configured to automatically start upon logging in. However, having too many programs configured to start automatically may result in a lengthy and slow login process. The Startup Programs tab lists all currently configured startup programs. The list displays default information for each program such as the process name and description. However, more information is available. To modify the information displayed in the list, right-click on a column header and enable/disable the appropriate categories. The startup information was found in the registry under one of the Windows. Run keys. The startup information was found in the user profile under a Startup folder. To see the exact location where the startup information was found, enable the Found In column (again, right click within a column header and select the desired column). The Found In column shows the exact registry path or folder path where the configuration settings were found. To stop a program from automatically starting, select it from the list and click on the Remove button. This operation cannot be undone and it does not terminate the currently running processes. 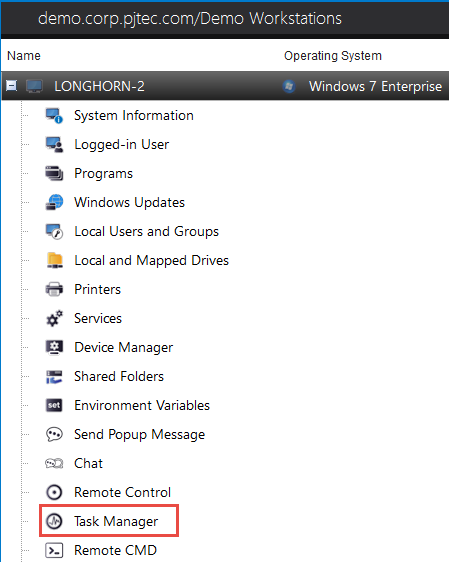 It only removes the startup configuration settings for the program. If you wish to terminate the process initiated under the startup configuration, select the item and click on the Go to Process button before removing the startup program item. If the process is still running, the focus is automatically set on it in the Processes tab. You can then terminate the process. Disabling a startup program prevents it from running the next time the user logs in. However, the entry is remembered and can be re-enabled at any time. To disable a startup program, select it from the list and click on the Disable button. A disabled startup program is indicated with a red cross. To re-enable a startup program, select it from the list and click on the Enable button.